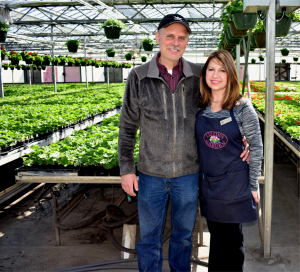 The greenhouses of Nelson & Holmberg, Inc. have a rich family history dating back to 1922, when Erik’s grandfather began the business in Berwyn, IL. In 1976 the company moved their site to 111th Street in Naperville, where it remains today. “Soon after I married Erik, my in-laws asked me to start a garden center to complement their existing wholesale family greenhouse” says Liz. “I had a degree in Economics and an MBA, but no experience in gardening or with plants. I liked plants, so I thought I’d give it a try.” The idea for a garden center became Lizzie’s Garden, the retail portion of the operation. Today, the business has 12 greenhouses that operate year round growing plants such as poinsettias, Easter lilies, cyclamen, cineraria, and geraniums. “We refer to what we do as farming with a heating bill” Erik jokes. Most of the plants at the greenhouse begin as cuttings or bulbs that the Holmbergs order from specialty growers. Once these arrive, they are transplanted and placed in one of the climate controlled greenhouses to be watered and monitored. “Watering is the toughest and most critical thing that we do” Erik continues. “Most of the watering here is done by hand, but we do use some drip irrigation.” In addition, each greenhouse is equipped with a hot water or steam heating system, fans, and removable panels to regulate the temperature. They also have alarms in place that will alert the Holmbergs if the heat goes out or the temperature gets too low. While growing plants in a controlled environment may seem easier than growing plants outdoors, the Holmbergs assure us this is not necessarily the case. “Growing living things is always a challenge” Liz says. “The amount of knowledge needed in horticulture, business, and mechanical equipment to run a greenhouse can be challenging. We still face problems with insects, bacterial diseases, viruses and equipment.” Over the years, the business has adapted to combat these challenges and stay up to date with consumer demands. The couple attends tradeshows to learn about new plants and techniques, and always insist on starting with the best quality seedlings or cuttings. They also hand pinch certain breeds of plants, which removes the center stem and promotes outer stem growth for a fuller shaped plant.